Lysholm 2010-2011 Camaro Supercharger Kit  : Supercharger Superstore, Your Online Source for Vortech Superchargers, Paxton Superchargers, Procharger Superchargers, Magnacharger Superchargers and Techco Superchargers! 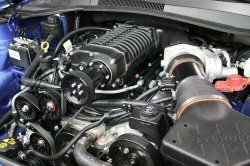 Complete twin-screw supercharging systems featuring the Lysholm 2300 supercharger are available for the 2010-2011 Camaro SS. These systems include all components required to bolt onto a stock LS3 or L99, including a fuel system and calibration upgrade for 91-octane fuel. 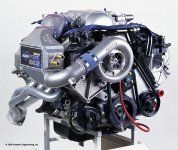 The complete system will boost your LS3 camaro to 580HP and 541 lb/ft torque with 7-9 PSI from the supercharger at the factory redline. Installation of the complete system on an L99 model will boost from stock (400HP, 410 lb/ft) to 550HP and 530 lb/ft supercharged. Note: HP/torque ratings are quoted at the crankshaft (based on a percentage increase from actual rear-wheel measurements). Lysholm 2300 twin-screw supercharger with 6-rib drive pulley, integrated bypass valve and actuator. The twin-screw design provides maximum low-end torque as well as far greater efficiency and horsepower gains compared to the traditional (as well as newer) roots-type blowers. Manifold boost pressure with 3.65” supplied pulley is 7-9 PSI (assuming no engine modifications and OEM engine redline). Supercharger drive assembly includes black anodized billet aluminum tensioner plate, idler, drive belt and all necessary hardware. Hand-held programmer (controls ignition timing and fuel enrichment), Supplied SCT programmer re-flashes the ECM with a safe, custom Lysholm calibration for 91-octane fuel (not included with tuner kits). High flow replacement fuel injectors (not included with tuner kits). High-flow bypass valve provides for increased compressor efficiency and temperature control. Optional 4.5" mandrel-bent aluminum air inlet assembly with high-flow reusable air filter will be available as an upgrade for high-performance racing and off-road applications. Complete bolt-on system includes replacement MAF housing, all necessary belts, pulleys and fasteners. 3-Year/36,000-mile powertrain limited warranty optional (coverage is from vehicle original in-service date). This system is compatible only with “821” and “823” (rectangular port) cylinder head castings.